Venture in for a very personal, extremely up close encounter with the most feared and misunderstood predators on the planet. Immerse yourself among native Hawaiian sharks, up to four different species in nearly 300,000 gallons of tropical water. There is no substitute for the intense thrill of Shark Trek, the best shark diving experience on Oahu! Come experience our exciting new version of the popular Shark Trek adventure that will allow guests to get face-to-face with Hawaiian reef sharks and other marine creatures in the Shark Cave without a barrier! This is Hawaii’s prime marine attraction, located on Oahu’s southeastern tip by Makapuu Point, just 15 miles from Waikiki. 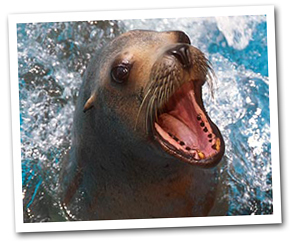 Come and visit this world-class marine attraction and enjoy up close views of dolphins, sea lions, penguins, stingrays and many other creatures of the ocean. You’ll even be able to see the world’s only "Wolphin," a mix between a dolphin and a whale! The park offers a whole range of packages that are entertaining as well as educational. Tour the park and say hello to all kinds of marine life, sit back and watch the thrilling animal shows, or if you want to get wet, swim with dolphins in the park's large lagoon. 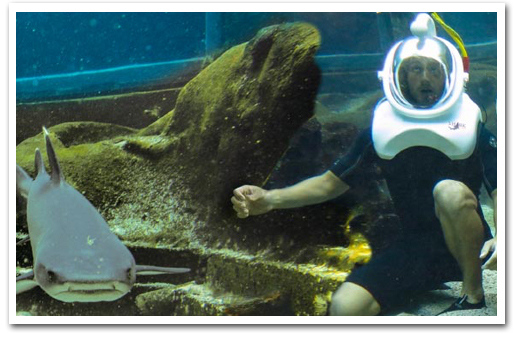 For the adventurous there is an underwater trek that allows you to walk 18 feet down among many colorful tropical fish! Even experience a luau, a traditional Hawaiian feast featuring an all-you-can-eat Hawaiian buffet dinner and a stunning Polynesian revue. It's the only luau in Hawaii that also boasts a spectacular dolphin show. This East Oahu attraction is a place to enjoy the company of dolphins, sea lions, rays, sharks, native fish and more. With a focus on educational and interactive programs, Sea Life Park Hawaii is small enough to enjoy on foot but diverse enough to be a full-day destination. Sea Life Park Hawaii is where the heart meets the sea. No amusement park in Honolulu will allow you to experience a variety of unique animal encounters and other interactive opportunities like Sea Life Park Hawaii. From dolphins and sea lions, to sharks and Hawaiian rays, we provide you the opportunity to get up-close and personal with our animals in an intimate setting. Dive into the science of our sea! Why go to a water park on Oahu when you can have fun learning about marine animals? From Touch Pools, Penguin Trainer Talks and interactive classrooms, we offer something for everyone in the family. Our five habitats and exhibits are a great way to learn and observe the animal's behaviors. Whether you're watching penguins jump in and out of the water, enjoying the company of lovebirds, or stepping into the breathtaking world of Hawaii's sharks, Sea Life Park Hawaii will delight you. *Schedules are subject to availability. Standard park hours are 9:30 am - 4:00 pm. The last show is at 3:00 pm. General park admission is included in the price. Includes transportation from select Waikiki locations and must be reserved 72 hours prior to arrival date. It is important to arrive 30 minutes before the start of your reserved program at Sea Life Park Hawaii. Program lasts approximately 45 minutes (20 minutes in the water). NO jewelry (including piercing jewelry) or anything that can potentially fall off in the water, such as sunglasses, glasses, rings, bracelets, necklaces, hair ties etc. The use of safety vests is required for all participants. Approved vests are provided to participants. We welcome people with disabilities! Please contact us to learn more. Locker Rentals: Lockers are available for $3. Wheelchairs: Wheelchairs can be rented for $5 per day. Guests are allowed to enter the park with their own wheelchair. Strollers: Single strollers can be rented for $5 per day.